Interest rates on U.S. Treasury notes with a maturity of 10 years fell last month to nearly the lowest since World War II. They may go lower still. Today’s low rates reflect both the weak outlook for most advanced economies and a desperate scramble globally for safe places to park cash in extraordinarily uncertain times. Investors are buying U.S. treasuries because they are more concerned — as Mark Twain famously put it — about the return of their capital than the return on their capital. Rates are even lower elsewhere. The Financial Times (essential for monitoring global markets) reports today (July 18) that yields are negative — that is, effective interest rates are less than zero — for the government bonds maturing in two years or less of six countries. They are Germany, Finland, Denmark, Switzerland, the Netherlands and Austria. France’s two-year borrowing costs are approaching zero. Real interest rates — nominal rates less inflation — have been negative on long-term government bonds of the U.S., Germany and the U.K. for some time. Tomorrow’s FT (July 19, 2012, Page 21) reports that Germany for the first time ever sold two-year paper at a negative yield. Buyers of 4.2 billion Euros worth of two-year German bonds will get 99.94 Euros at maturity. Uncle Sam was stripped of its cherished Triple-A credit rating by Standard and Poor’s last summer after the corrosive debate over raising the debt ceiling. 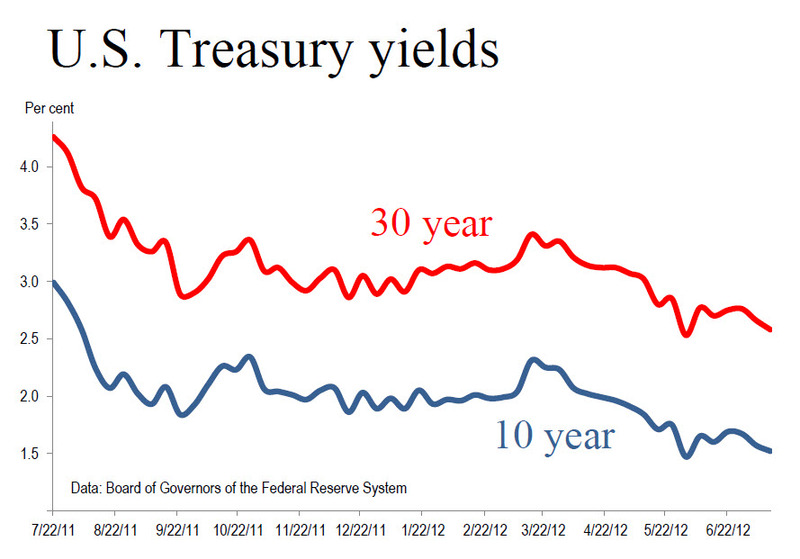 But as the chart shows, borrowing costs since have declined substantially. Predictions of an end to the bull market in bonds have been a staple for years. I will be happy to see interest rates rise. Higher rates will signal that the global economy is on the mend. But I have a hunch I will have to wait a long time for that signal.